I’m struggling a little with this topic today. On the one hand, a lot of my books are part of long-running series, so I am just patiently waiting for the next outing to see what happens next. I know the author has something wonderful brewing. On the other hand, I’m feeling conflicted with this week’s prompt. May 3: Ten Childhood Characters You’d Love To Revisit As Adults (ie a novella or something to see what they grew up to be) — you could always just pick YA characters you’ve read recently you wouldn’t mind revisiting in 10 years or so. Is this saying 10 characters I’ve read when I was a kid and now I want to see what they are up to? Or just 10 kid characters that I’d like to see what they are up to as adults? (But then why the 10 recent YA reads suggestion?) Apparently I’m over analyzing. I’m just going to go with 10 characters that I would like to revisit and see what they are up to. Nancy Drew. Obviously. What happened to her when she grew up? Is she a detective? A lawyer? Did she become crafty and open a store on Etsy? There’s a new CBS series coming out that is exploring this very topic. Alice. What happened to Alice after she went Through the Looking Glass? Did she grow up to be a boring adult, or did adventure follow her wherever she went? Harry Potter. Yes, yes. I know JK Rowling gave us a lovely afterward so we knew where these characters ended up. But I want more! They could have adult adventures. Or we could follow the next generation at Hogwarts. (Preferably, let’s do both. Are you listening JK? But don’t stop writing Cormoran Strike novels either.) I know it’s not just me. We need more Potter! The Cullens (and Friends). Ok, some of you are groaning right now. But come on. These guys live forever. You’re telling me that Breaking Dawn was the end of their adventures? That the Volturi won’t be back? And what about Renesme? Let’s get Baby Cullen all grown up and see what happens with her and Jacob. Georgie McCool. Landline was one of my favorite books that I read last year. I still want to find out what’s in store for Georgie McCool. Willowdean Dickson. My problem with Dumpin’ was that it ended. What happens next? I want more time with Willowdean. Charlie Swift. I loved this fun series featuring odd-couple partners Charlie and Gigi. Three installments came out, and then the publisher nixed the series. What happened with Charlie? Did she find love with Father Dan? Or maybe settled down with cop Connor Montgomery? We’ll never know. Simon Snow. I just finished listening to Carry On, and I’m ready for more. Ms. Rowell seems to have a knack for creating characters that I want to revisit. I know, I know. 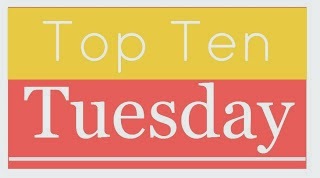 This is a bookish top ten. But I can’t help it. I like TV stuff too. Gilmore Girls. Did Lorelai marry Luke? Where did life take Rory? Does Lorelai continue the Friday night dinners with her mother? What about the rest of Stars Hollow? Thank goodness there’s four new episodes coming! But I know it won’t be enough. I’ll still want more. Veronica Mars. This Marshmallow can never get enough Veronica. Never. I have the two books that were published, but I haven’t read them yet because I just don’t want to get to the end. Here’s hoping for a TV revival, or at least another movie. Another Kickstarter? Anyone? Bueller? We need more LoVe! What about you? What characters do you want to revisit and find out what they’re up to? What was your take on this week’s TTT? Comment below and link up to your own TTT if you’ve got one! Nancy Drew and I am now trying to recall some favorite series I loved. A nearly perfect list! I may swap VM for Dexter. Any list with VMars on it is a winner for me! I almost put Renesme and Jacob on my list, too. I always felt they needed a book dedicated to their love. I like that show, but I haven’t seen many episodes. Great list! I have Nancy Drew too – so many questions about how she ended up! Most of the others you mention I haven’t read but I have heard of them all. Good point about the Cullens. It wasn’t my favorite series but it would be interesting to see what happens next. Yup everyone wants more Potter! I’m so excited for the Gilmore Girls revival, if Luke and Lorelai aren’t married/don’t get married, I will not be happy!